How many times a day do you reminisce or review the past? And how many times a day do you find yourself dreaming of the future? We are all doing it constantly. If you really think about it our days are made up of a constant stream of reviewing the past and looking into the future. You aren't really doing anything in the present because it doesn't really exist. The truth is that the present is the meeting point of the past and the future. It is the split second between when we are moving from what is going to happen next (the future) to what has already happened (the past). It feels like the present because you can see yourself doing whatever you are doing right now and it looks like the present because you can say “I am right here in the present” but it isn't and you aren't because your present, which was the future, has just become the past. Just as you are saying the word “present” you have already gone from the future to the past. So there is no middle ground, no place where the present exists. It’s a constantly moving moment that exists as an infinitesimal gap between the future and the past. The closest thing to the present is the immediate future and the most recent past. But we constantly hear people talking about being present or staying in the present moment. How can we exist in a present that doesn't really exist? What are we to do? The key to expanding your moments of “present” is to reduce the amount of time you spend thinking about the past or the future. You will still be going from the future to the past but you can refocus your viewpoint. You can reduce your mind’s need to time travel and keep it close, keep it right here, right now. Try to focus on the things going on around you. Feel your body, feel your breath going in and out. Feel your body resting on the chair you are sitting in, feel your feet on the ground. See the clouds rolling by, the birds in the air, the wind in the trees. Smell the smells, taste the tastes, feel the sun on your face, really “be” with the person you are talking to. Step away from your mind’s endless churning, from its constant searching and reviewing. Reduce your visits to the past and future, I say reduce because you can’t eliminate your memories or stop dreaming of future possibilities because it’s a basic part of our human mind, but you can pull back from your need to dwell in the past or the future. Make a renewed effort to stay right where you are every day. Every time you start drifting off into past recollections or looking forward too far, pull yourself back. Not the present but now. 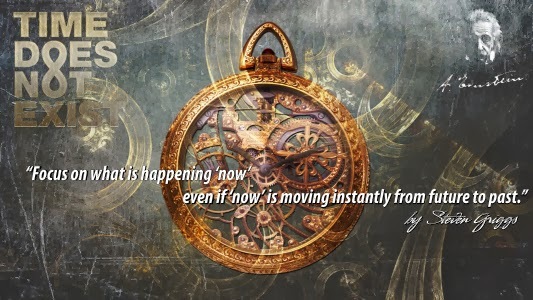 Focus on what is happening “now” even if “now” is moving instantly from future to past. It’s the closest we can get to the present.